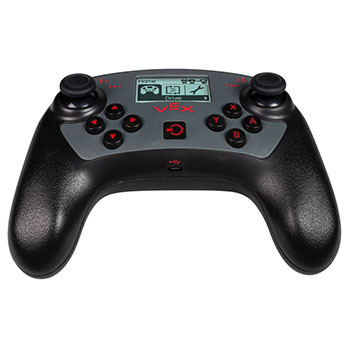 The V5 Controller packages two analog joysticks and 12 buttons into a familiar video-game style design. With its Monochrome LCD screen, the V5 Controller provides users with instant feedback from the Robot Brain. It is used to control the robot and communicate wirelessly to the brain using either VEXnet or Bluetooth. The screen allows users to start and stop programs remotely and view the robot's battery level and radio status. The screen supports 12 languages. During a competition, drivers and tethered co-drivers can see the competition clock and game state on the V5 Controller's screen. Independent messages can be sent to each controller when using two tethered controllers. 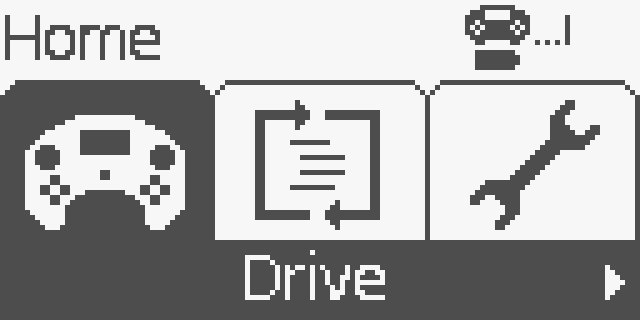 Programmers can send data and multilingual text to the screen for debugging and driver information. Additional programmable widgets allow users to show gauges that can be digital, analog, and numerical. The controller has a USB port for charging the internal rechargeable battery, and for wireless programming and debugging. The user can configure all 12 buttons on the controller to meet their specifications. Charging the controller takes only an hour, whereas the charge time of the VEXnet Joystick varied greatly depending on the type of rechargeable batteries used. The internal rechargeable battery is designed to run all day at events (10 hours) without a need to recharge, whereas the VEXnet Joystick has a run time of less than an hour. The controller does not require extra hardware, like the VEXnet keys of the VEXnet Joystick, in order to connect with the V5 Robot Brain. 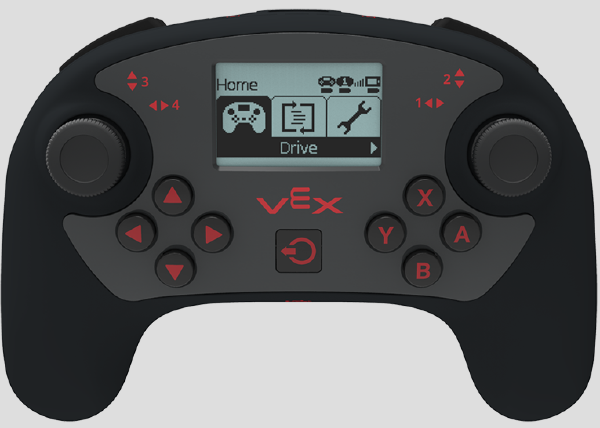 When connected to a computer via USB, the V5 Controller is wirelessly connected to the V5 Robot Brain for programming and debugging, unlike the VEXnet Joystick that needed to be wired directly to the VEX ARM® Cortex®-based Microcontroller. The screen is a pivotal improvement to the V5 Controller because it frees users of needing to interpret the 27 LED red-and-green blink patterns of the VEXnet Joystick. Instead, users can read and interact directly with the visual display.